The research team lead by Pascal Fossat in the Department of Life Science and Health, Université de Bordeaux (France), concluded that this research "may alter our conceptions of the emotional status of invertebrates." When Professor Fossat and his colleagues mildly shocked crayfish, they placed them in an aquarium maze containing pathways that were well lit and dark. 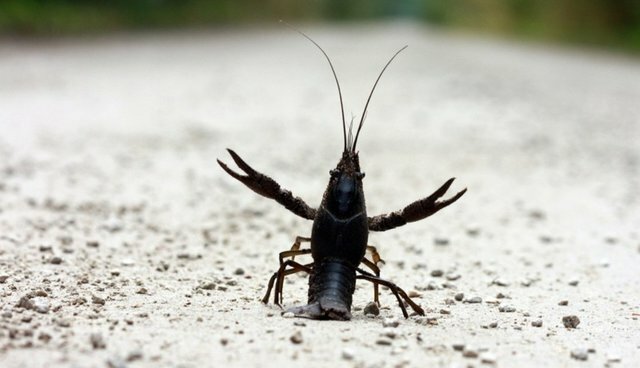 The shocked and stressed crayfish strongly preferred the dark paths and rarely entered the lighted ones, whereas the non-stressed crayfish also preferred the dark pathways but also entered the lighted ones. What is incredibly interesting is that light avoidance by the stressed crayfish is associated with heightened levels of the brain neurotransmitter serotonin that also is associated with human moods. In addition, injecting crayfish with serotonin made them anxious and treating them with the drug chlordiazepoxide that's used to treat anxiety in humans reduced the anxiety in the stressed individuals. They then entered lighted pathways. When I read about this fascinating research I was reminded of research that demonstrated that crabs feel pain and work that was done on honeybees that showed that they too display human-like responses to stress and depression. The bees showed altered levels of neurochemicals (dopamine, serotonin and octopamine) that are associated with human depression. These fascinating studies show that we need to be very careful making claims that invertebrates do not have emotional lives or feelings. In fact, there are marked similarities with vertebrates including humans. Many other invertebrates who supposedly don't feel pain are served up as food in countless billions and it's time to reconsider how these animals are treated in the food industry and to eliminate pain from the menu. Researchers agree. Please stay tuned in as more "surprises" are revealed about sentience in other animal beings and how they really do not live pain-free lives. Membership in the sentience club is ever-expanding.